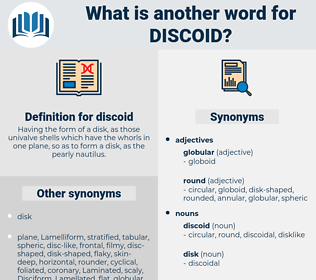 What is another word for discoid? Having the form of a disk, as those univalve shells which have the whorls in one plane, so as to form a disk, as the pearly nautilus. indirect, unfinished, soft, dishonest, small, tiny, low, deceitful, inadequate, straight, lacking, incomplete, weak. Beads are found by the myriad - a single Wiltshire grave furnished a thousand - mostly of a discoid shape, and about an inch in diameter. 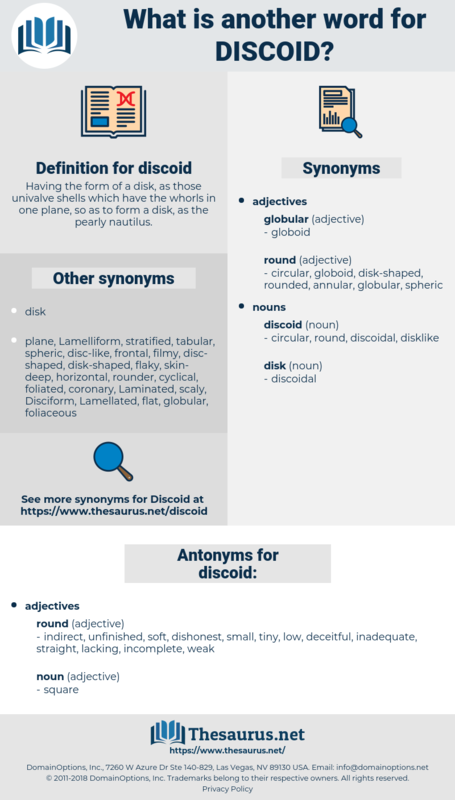 dickhead, dedicate, disguised, deck out, desiccate, disassociate, digested, death squad, dissected, die-cast, death's head, decode, dissect, dakoit, dictate, dedicated, dockside, dosed, dytiscidae, deceased, due south, decided, digit, dicot, disgust, dogtooth, dziggetai, dodge city, doughty, dacoit, decidua, desiccated, do good, do-si-do, digest, detoxicate, dusty, dissociate, duct, duckweed, dust, dicky-seat, due west, dictated, disgusted, detached, disquietude, deist, disquiet, dejected, death seat, diskette, detect, due east, dacite, dagda, decade, deduct, disused, dog-sized, dakota, dacoity, dish out, dioxide, dugout, dogged, duck shot, ducat, decked, decide, desuetude, degust, decayed, disquieted, detected, decked out, dickie-seat, dead set, dasyatidae, dished, dogwood, dissuade, decussate, deuced, dig out, decoct, deceit, dazed, digitate, De Sade, diseased, deject, dead weight, dighted, detested, detest, destitute, dakoity, diazoxide, docket, desist, dashed, dickey-seat.